Yeah, I know. I should have seen this by now. But I hadn’t. I’d even managed to watch The Great Waldo Pepper before this. So what to say about it? It’s all surface really. What you’re watching is two of the biggest stars in Hollywood at the time just cavorting around a facsimile of the West. The thing I enjoyed the most was probably the relentless pursuit that formed the central act of the film. The ominous thundering of hooves and Butch’s refrain ‘Who are those guys?’ build to the now infamous jump. Unfortunately the film sags a bit after the pursuit – the last half hour is a bit of a meander until the legendary stand-off. But having said that, there aren’t many more appropriate ways to spend a Sunday afternoon. 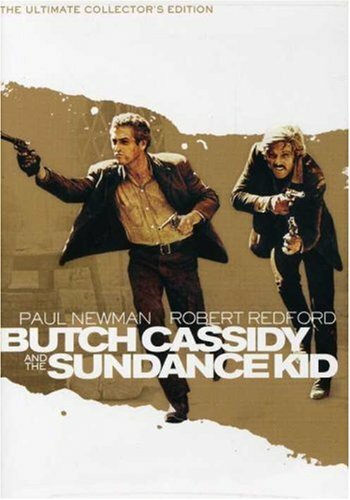 Note: Butch Cassidy and the Sundance Kid is listed in the Neon book 1000 Essential Movies on Video under ‘Buddy Movies’. A bit of the all-American boy, Robert Redford, seemed appropriate for a Sunday afternoon viewing. I went into the film with a bit of prior knowledge having read screenwriter William Goldman’s excellent ‘Adventures in the Screen Trade’. In it Goldman describes the process by which the screenplay was commissioned and eventually constructed and the way he realised, upon watching it with an audience, where he had made a dreadful error of judgement. At the halfway point in the film this error is made when a major character is killed, somewhat unexpectedly. Goldman said the audience reactions were absolutely dreadful. He knew then that they’d lost the audience at this point and that they weren’t going to buy into the rest of the film. Now I’ve seen it, I understand. It may well serve the narrative but it completely rips the heart out of the film. The problem is exacerbated by the callous way in which the surviving characters seem only to worry about their careers in the scene that follows. It’s a catastrophic error in the development of the film. Aside from this the film does have a real charm about it. Goldman, George Roy Hill and Robert Redford are the team from Butch Cassidy and The Sundance Kid (which will also be reviewed on here soon). Aforementioned death aside, this comfortable arrangement translates to give much of the film a welcome sense of ease and of an accomplished and friendly atmosphere. Redford is a movie star, a latter day matinee idol who has a fantastic screen presence. 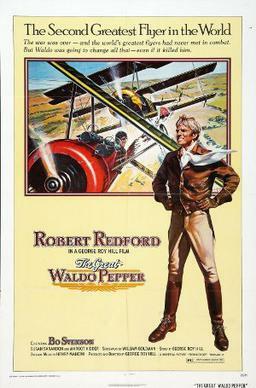 Learning that all the actors, Redford included, did all of the aerial stunts made the aerial sequences of the film become even more impressive. This was the era of the ‘barnstormers’, daredevil pilots without a World War to fight and with plenty of skill in a bi-plane who would go from town to town offering rides and stunts for a fee. The film captures this lost era with some stunning photography and, if you can forgive the mid-film calamity, a pretty engrossing story. Note: The Great Waldo Pepper is listed in the Neon book 1000 Essential Movies on Video under ‘Flying Movies’. 20. Let the Right One In (Tomas Alfredson, 2008) #190 in IMDB top 250. Oskar, a bullied, shy 12 year old boy in a snowy Norwegian town befriends Eli, a girl who has recently moved in next door. But Eli has a secret that means she’ll always be 12 and she can’t be exposed to sunlight. Let the Right One In is a beautifully shot portrayal of the beginnings of adolescence where adult emotions and situations begin to violently invade childhood. The film is dependant on the child actors and their performances are utterly convincing, especially Lina Leandersson as Eli who conveys the combination of ancient ferocity and isolated youth with understated aplomb. Note: I’ve set myself a kind of ‘commission challenge’ with this review of making it only 100 words long. Let me know if you think I managed to get everything across.